Tonight at WWE’s annual TLC: Tables, Ladders, & Chairs pay-per-view, Nia Jax finally had the opportunity to prove that she is in fact “Ronda Rousey’s nightmare.” Jax certainly didn’t make things easy for the RAW Women’s Champion, as she, of course, had Tamina in her corner for this match. And as commentary noted from the very beginning, it wasn’t quite clear just how much Tamina would actually be a factor in this match, especially as a non-gimmick singles match on the TLC card. Also going into this match, Ronda Rousey and Nia Jax still had “unfinished business,” as the last time they faced off—at this year’s Money in the Bank pay-per-view—Jax was the champion… but there was no official winner or loser—as Alexa Bliss cashed in her Money in the Bank contract during the match and stole the RAW Women’s Champion out from underneath both women. 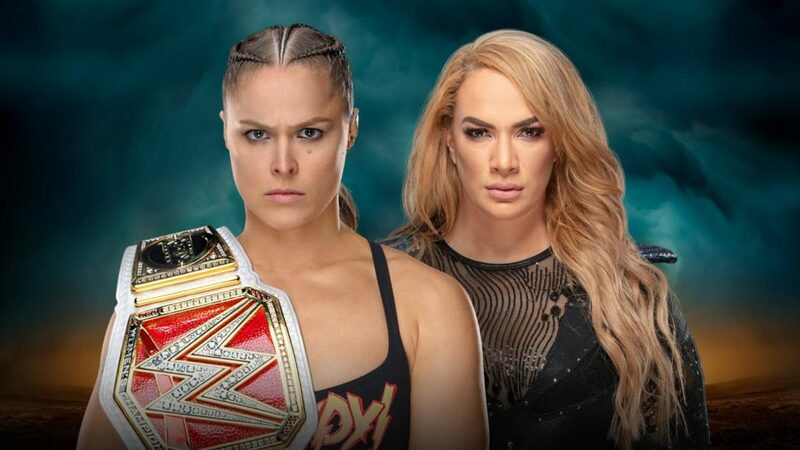 This rematch of sorts began with Nia Jax using her power game against Ronda Rousey’s quickness, but it instantly looked like the champ’s plan was a more solid game plan. In fact, she Rousey was clearly frustrating Jax in the early moments of the match. As Jax finally got her hands on Rousey and taunted her with the “Facebreaker” punch, that only lead to Rousey going for the armbar early. However, Nia Jax was able to avoid an early loss by turning it into a powerbomb. Then things were all in favor of Nia’s power game. 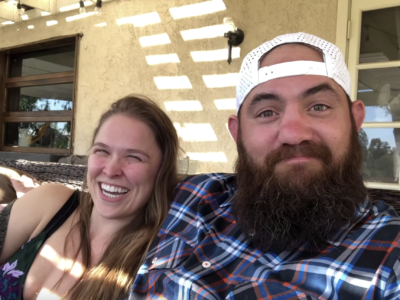 She tossed Rousey shoulder-first into the corner, then doubled up by ramming into said shoulder, doing all she could to prevent the champ from locking the armbar back in. But Rousey still had her impressive transitions and her quickness, so the only thing that could eventually prevent her from trying to submit Jax again—in any submission she could think of, not just the armbar—was Jax tossing her into the barricade. But that’s was not enough to put “The Baddest Woman on the Planet” away, and from that point on, Jax was very visibly frustrated. Eventually, Rousey was able to regroup, deciding to go for broke with a crossbody from the top rope to Jax on the outside. But in perhaps a show of her rookie status—but also her living up to her word about being a “true champion”—Rousey refused to retain with a countout, instead struggling to get Jax back into the ring. On the plus side, once she got Jax back into the ring, Rousey almost immediately entered into her rowdy beast mode, even clocking Nia with a stepup Facebreaker of her own. But another crossbody attempt lead to Jax catching her that time and hitting her with the Samoan Drop. Somehow, that only got a two-count, so a frustrated Jax decided to up the ante and go with the Samoan Drop from the middle rope… which Rousey fought out of and turned into a big powerbomb. Again, only a two-count! So what would Rousey have to do to put “The Irresistible Force” down for good? Once Rousey went for the armbar once more, Tamina finally got involved with the match, distracting the champ so Jax could get her from behind. Jax was ready to finally hit the Facebreaker, only Rousey deflected and went for the armbar again. And this time, the end was pretty seriously nigh. In fact, before Rousey locked it in, she kissed Jax’s fist. Call it the official kiss of death for the Facebreaker. And once Rousey locked the armbar in? Nia Jax tapped, Ronda Rousey retained, and San Jose cheered. Post-match, Charly Caruso attempted to interview a defeated Nia Jax. 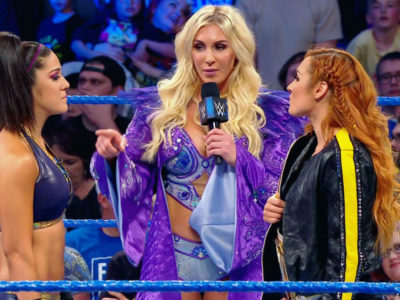 No comment, but maybe she should have spoken to Charly because she’s stopped next by the SmackDown Women’s Champion, Becky Lynch. “Remember when you broke my face,” Becky asks. She then beat Jax down, collecting her debt and letting this woman know: “Keep my name out of your mouth!” Tamina ran down to help Jax after “The Man” had already left, so maybe that relationship isn’t quite paying the dividends Jax expected it to.